DIAL: Black Dial with two large white subdials and radium hour markers. Large metal hands with luminous center. CONDITION REPORT: Watch is in original and Excellent condition. The dial shows signs of aging and the luminous material has darkened over time, but is original radium (UV & Geiger OK). The material in the hands may have been stabilized or refilled at some point as UV lingers slightly. The case is unpolished and in strong condition. The bezel is original with visible wear marks. 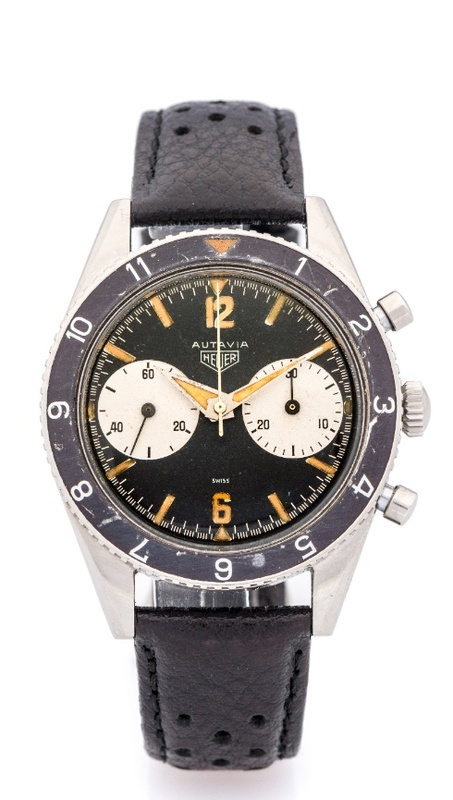 Heuer introduced the Autavia wristwatch collection in 1962 and was produced until to 1986. The dashboard timers with the same name were produced from 1933 to 1958. The name "Autavia" is derived from the words Automobile and Aviation. This name was indicative of the purpose these chronographs were intended for.